Thank you to all of you that have read along with my adventures this year, especially those who took the time to comment whether it was to compliment my successes, laugh with me at my project failures or to offer some advice - it was all gratefully accepted and appreciated! We've just finished a late night Christmas present wrapping session - I don't know why we leave it to the last minute every single year, maybe it's become our Christmas tradition?! At least we didn't run out of sticky tape or paper, and all is now done ready for the crack of dawn when small children like to wake, particularly on Christmas morning. I've leave you with some vintage Christmas loveliness, mainly because I didn't want to leave that embarrassing last project as my last post for the next 2 weeks! 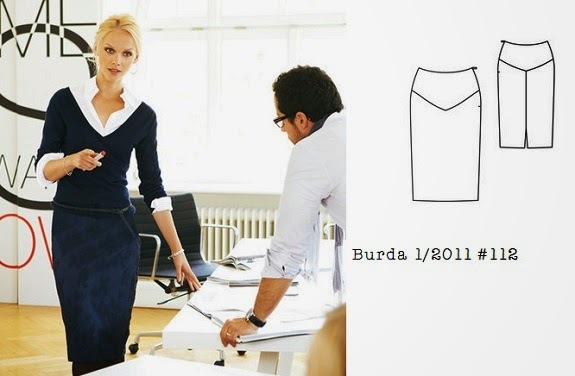 Burda of the month 12/2014 #107 blouse: finishing the year on a hilarious note! I was all primed to give myself a high five for finishing my December Burda of the month project but it turns out that instead I'm doing a public service by giving you all some probably much needed mirth in this crazy pre-Christmas period with all the associated stress, tiredness and general frantic running around trying to do everything and be everywhere. I thought the placement of the drawstring on the pattern drawing looked too low and would probably look better higher, but it turns out that it couldn't be any higher because of those sleeves. But it makes the back billow out hugely above the drawstring at the back, and the side view looks completely crooked. My verdict: an easy pattern to sew, but save your time and your fabric. Oh, won't someone think of the fabric! For my crime against this innocent and undeserving fabric, my punishment is to unpick those overlocked seams and make this into something better and wearable. Isn't it funny how sometimes the simple projects can cause you just as much if not more grief than complicated ones? I've spent more time than I care to think about trying to make a simple unlined cropped jacket in a white stretch denim but it is causing me huge fitting issues and after unpicking it for the third time I had to step out of my sewing room for quite a few days. I was completely over sewing which is unlike me. I even had a sewing day and lunch with some friends from the ASG where I did little more than eat, chat and watch others sew! Hence why I'm calling this skirt a circuit breaker - I just wanted to make something simple that I could wear straight away to get back some of that instant gratification of sewing and lose some of the frustration. And it worked, because since finishing this last week I've made three more things, including my last Burda of the month project (all yet to be photographed though). I also shortened the yoke at the back so that the seam lines matched at the side but I cut it down the centre back instead of on the fold so I could use a centre back zip instead of a side zip. Since I have curves and bumps at my sides in the hip area I prefer not to use a side zip as they tend to ripple or stick out a bit. I also made a mitred vent at the hem instead of just a split, it just seems more finished to me but again you can barely make out this detail due to the fabric I used. The fabric I used is a cotton sateen bought from Spotlight several years ago now. Because I know that sateen tends to bag out after a few hours of wear and wrinkles terribly, I underlined the skirt in a thin lilac cotton that was a long term stash resident, and handstitched the yoke to the lower skirt portion at the seam line. The insides of my garments are all about function - I never have enough patience to make it pretty with French seams and lace around the hem line some other more attentive sewists! So I don't want to jinx myself, but this altered pattern could well become my TNT and holy grail of pencil skirts! I've already worn it twice in a week and a half and it is really comfortable. With my pear shape, I find that skirts are usually too tight across my hips and thighs so it rides up at the waistband, or I make them looser to skim over my hips but it means that the skirts twist around when I'm walking. This one stays just where it should and even thought it looks very fitted I could sit comfortably in it. And even though I've worn it all wrong in this photo - I should wear darker colours on the bottom not the top - this skirt goes well with quite a few lighter coloured tops in my wardrobe so I can me wearing it quite frequently this summer. If only I could finish that white cropped jacket to wear with it though!